Finance Commission came into existence in 1951. It was established under Article 280 of the Indian Constitution by the President of India. It was formed to define the financial relations between the centre and the state. Till date, Fourteen Finance Commissions have submitted their reports. Finance commission is antonomous body which is governed by the government of india. 1. The 14th Finance Commission was established in 2013 and is headed by Former Governor of the Reserve Bank of India, Mr. Y.V. Reddy, is the Chairman. 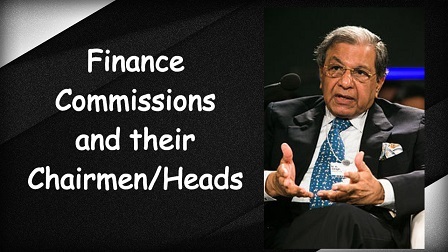 Here is a list of List of Finance Commissions and their Chairmen/Heads which will help you in exams like UPSC, BPSC,SSC MTS,SSC CHSL, SSC CGL,Railways and other Banking Exams like IBPS, RBI, SBI Clerk etc.